(Oct. 4, 2012) -- Half of The University of Texas at San Antonio's incoming class graduated in the top 25 percent of their high school classes, according to the Office of the Vice Provost for Accountability and Institutional Effectiveness. Twelve percent graduated in the top 10 percent of their high school classes. Overall, Hispanic students make up UTSA's largest minority group at 45 percent. Additionally, approximately 62 percent of UTSA students are members of minority groups. This year, UTSA began a new four-year Graduation Rate Improvement Plan (GRIP), which will help the Class of 2016 and all other undergraduates by setting higher expectations, providing better guides for academic success and minimizing barriers. The initiative will include expanding the focus on integrating freshmen into a university setting, emphasizing four-year degree plans, increasing financial aid incentives and streamlined curricula, and adding faculty and advising staff. 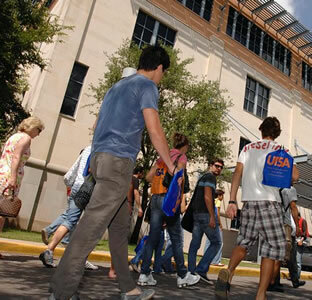 On pace with UTSA's 2016 Strategic Plan, which targets overall enrollment at 30,000 by the year 2016, a preliminary census indicates that 30,474 students enrolled at UTSA in fall 2012. In Texas, preliminary student enrollment figures at public higher education institutions are forwarded to the Texas Higher Education Coordinating Board for review. Enrollment is one of several criteria used to determine the amount of state funding each institution receives to support its education mission. * Minority includes: Black or African American only; Hispanic of any race; Asian only; American Indian or Alaska Native only; Native Hawaiian or Other Pacific Islander only, and two or more races.